Actor Philip Seymour Hoffman died of an accidental overdose of a mixture of drugs including heroin, cocaine, amphetamine, and benzodiazepine, officials have said. 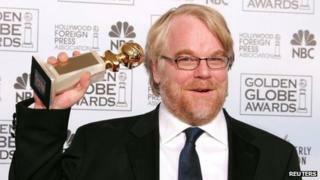 The Oscar winner, 46, was found dead at his home in New York City on 2 February with a syringe in his arm. He had struggled with drug addiction and had recently acknowledged he had relapsed after being clean for years. The New York medical examiner revealed the post-mortem results on Friday. He was survived by his partner of 15 years, Mimi O'Donnell, and their three children. After 23 years of sobriety, he reportedly checked himself into a drug treatment programme for 10 days last year after relapsing in 2012. After a playwright and friend found his body in his flat in Manhattan's Greenwich Village neighbourhood, police arrived and discovered dozens of bags of heroin. One of the most admired actors of his generation, Hoffman won an Academy Award in 2006 for his role as Truman Capote in Capote. He was also nominated for Charlie Wilson's War, Doubt and The Master.